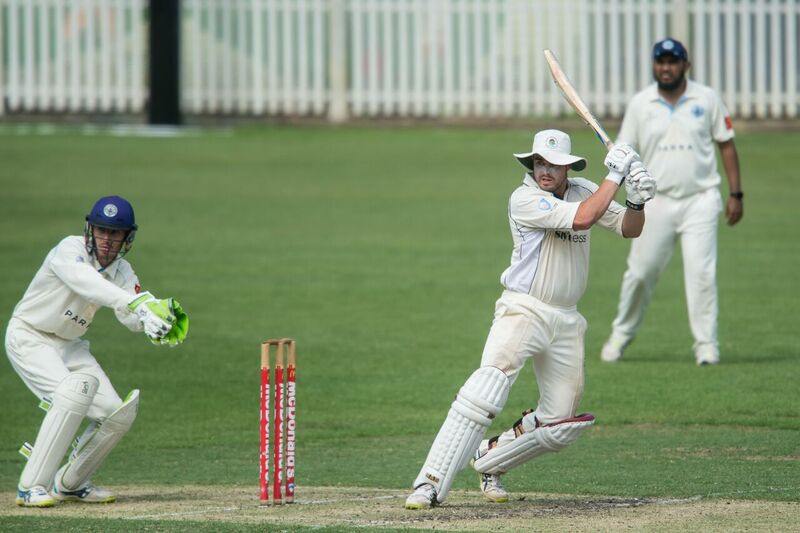 Round 5 of the NSW Premier Cricket competition saw Manly take on Parramatta in the one day format. The Tahs took the club championship trophy from Parramatta on the final game of last season which created hype heading into this round. 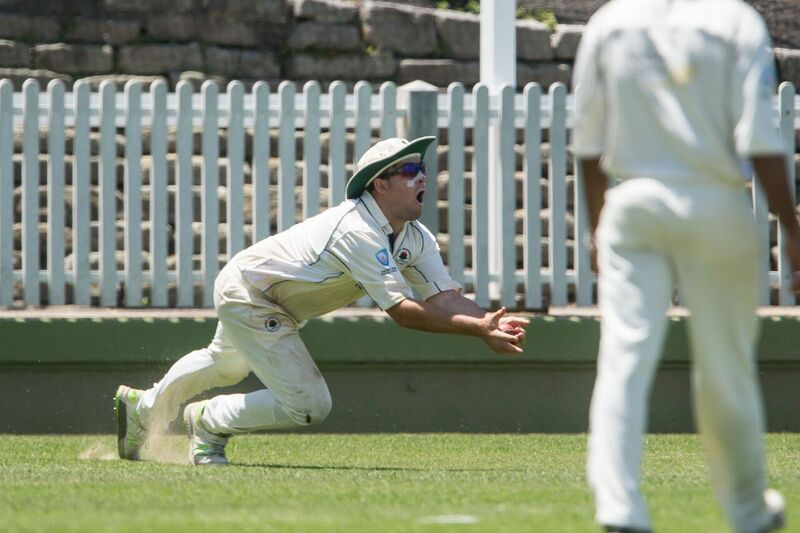 The Manly boys came away with three gusty wins in first, fourth and fifth grade, whilst suffered losses in second and third grade to the better team on the day. Our women’s third grade side had the bye whilst our PG’s boys season continued to derail, losing against an Eastern Suburbs side hunting for a finals spot on Sunday. 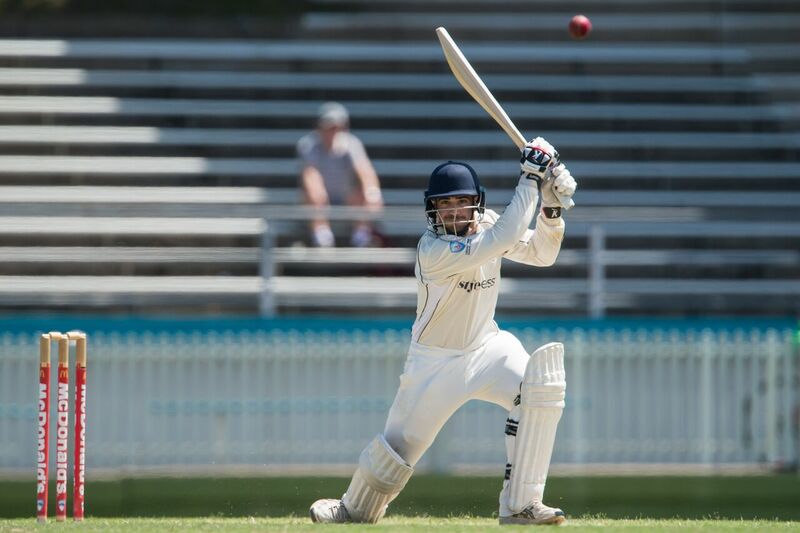 Highlights of the round included Logan Weston going back-to-back in first grade, hitting a wonderful 104 at Old Kings. He was backed up by Jake Carden who won first grade the game by taking 5/35 off his 10 ‘heavy’ overs. 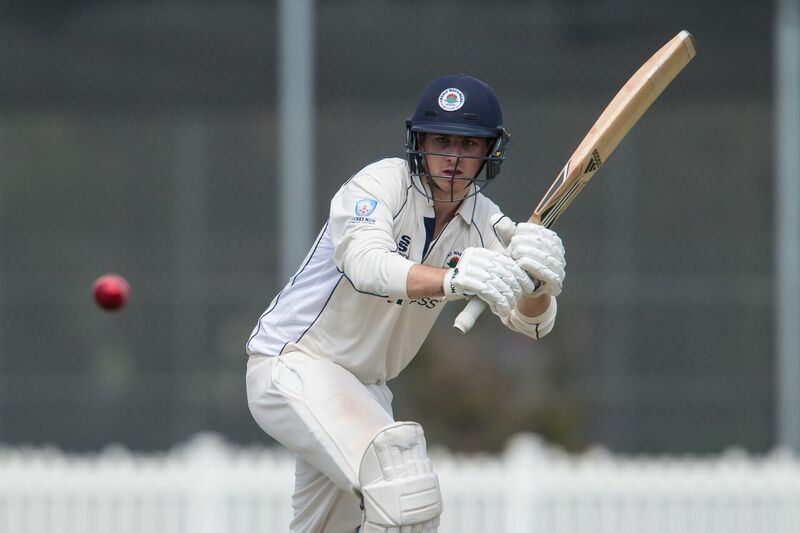 Whilst Aiden Bennet grabbed his first Manly 5fa in fifth grade, taking 5/38. Three wins from five against Parramatta pushes the Tahs up the Club Championship table as we look to keep climbing against Fairfield-Liverpool over the next two weekends. 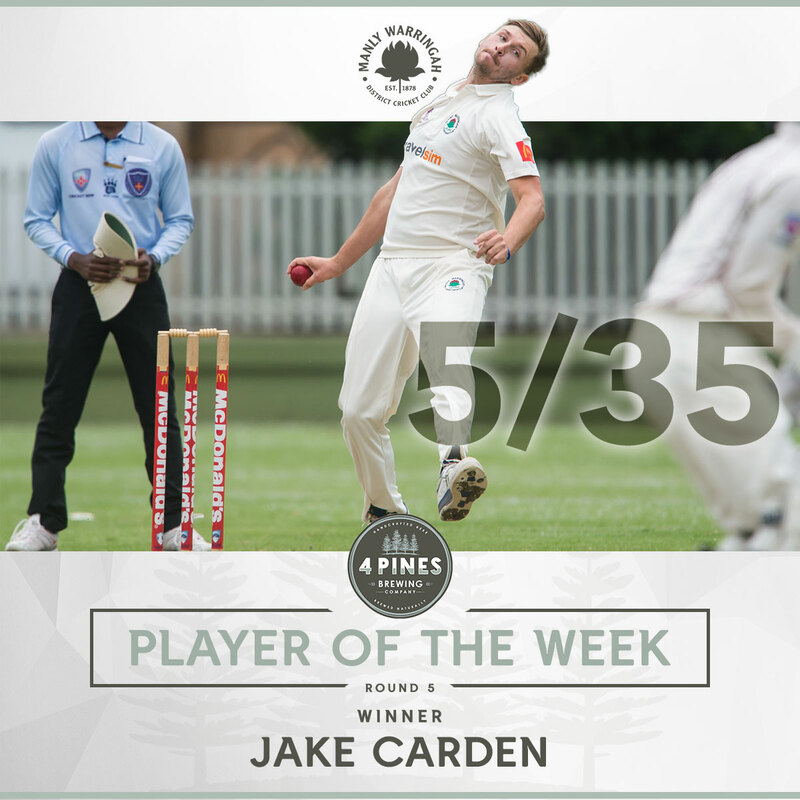 Jake Carden is the deserving winner of the 4 Pines Player of the Week after winning first grade a tight contest out at Old Kings Oval. Jake came on late in the game when Parramatta was cruising and proceeded to take 5/35 in a game-changing spell. His 10 overs were all class and allowed the Tahs to take home the points and kick start their season. 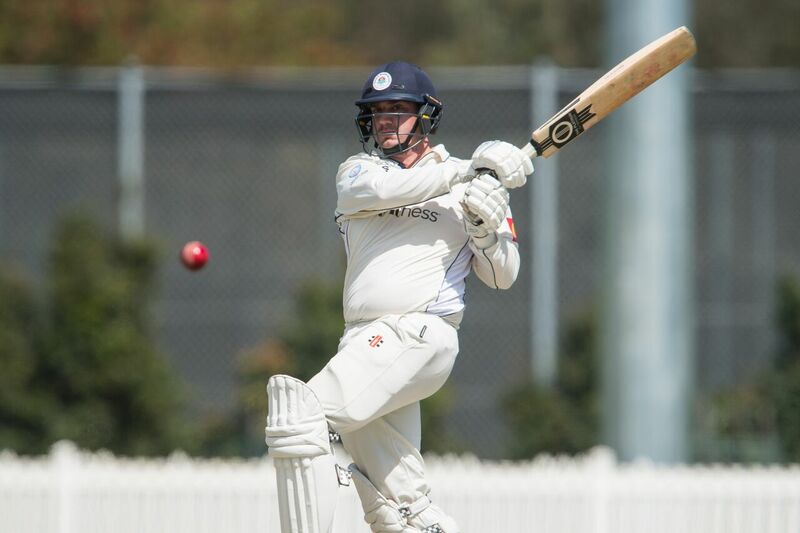 ‘Ping’ has been in fine form all season, and boasts one of the heaviest balls in NSW Premier Cricket. Hopefully the Tahs can see Jake take plenty more wickets for the season and add his to growing tally. Special mention to Logan for his back-to-back first grade hundred and Aiden Bennett for his first 5fa in the Manly shirt. Keep up the good work boys! 1st grade made the journey out to Old Kings Oval, on the back of Jack Edwards geographical knowledge which was get to the Parramatta leagues club and back yourself from there. Needless to say it was Jack who got lost and was last to arrive. After a lacklustre performance from both touch teams and some dubious refereeing from the juice man we proceeded to win the toss and bat on a good looking cricket wicket. Logan and Jack opened up and got the boys off to an aggressive start leaving Parramatta on the back foot. As they are know to do Parramatta hit back hard removing Jack for 8, Jay for 3, Greeny for 18 and AB for 0. Enter Ollie Davies fresh from finishing the HSC with a smile on his face from ear to ear. He looked comfortable from ball 1 and blasted a brilliant 54 from 48 balls with a couple of massive bombs! From here Logan and Faz continued to build before Logan was bowled for 104 off 116 balls. Faz and Foz combined to bump our score up to 278. Foster contributing a quick fire 45 and Farrell 34. Heading into the break we were confident we had enough on the board despite a fleeting thought we could have scored 300+. After the break Viss and Foz took the new rock from either end, with Viss removing the ever dangerous Ben Abbott early. Unfortunately from here and the better part of 35 overs our bowling plans didn’t quite come to fruition with Parramatta cruising to 2/186. They were cruising to victory with boundaries flowing and luck running in their direction. All of a sudden Foz induced a rare false shot from the in form Nick Bertus who departed for a brilliant 86. At 3/223 and Parramatta only requiring 5 an over to win the game it looked done and dusted for the Manly boys. Enter Jake (Spider-Man) Carden fresh from a spider bite pre game. Jake bowled one of the better one day spells seen in recent years, which saw Parramatta lose 4 wickets for 1 run from the 40 to the 43rd over. Jake finished with 5-35 a well deserved bag for the big fella. The game went down to a nerve racking finish with Parramatta needing 29 off 18, 18 off 12 then 10 off the final six balls. An early 4 in the last over put us on the back foot and eventually Parramatta required 3 for victory off the last ball. Joel executed a near perfect Yorker which trickled to mid wicket for a single leaving us victors by just 2 runs. A great game if cricket from both teams and a much needed win for 1st grade! Second grade started the day with early coffees and breakfast as a team where we got to witness the rare sighting of Starry ordering English breakfast tea. Manly bowled first and had the English import Aaron Beard open the bowling with great pace. Manly struggled in the field to get an early wicket though as the first wicket came after 90 runs, however that didn’t let us down. 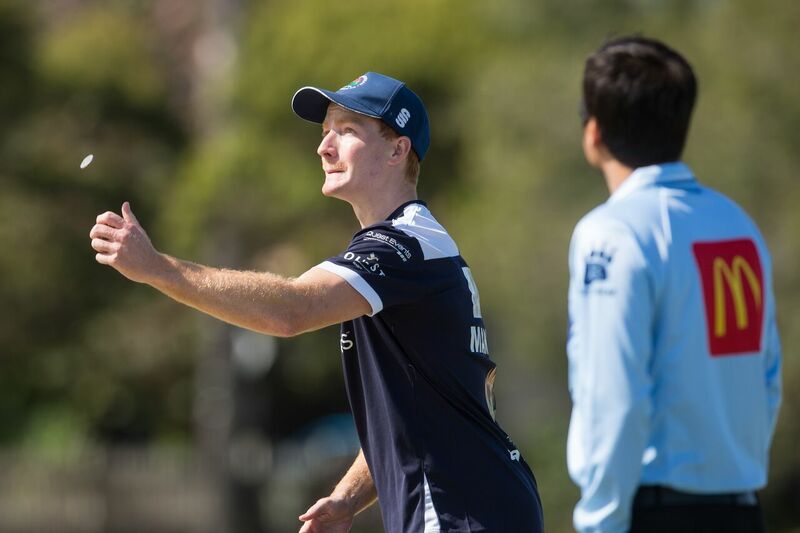 As we have done all year we have taken wickets in chunks, with Parramatta 1-90, 2-92, 3-98 and 4-100 off some brilliant bowling in partnership by Elliot Herd and especially Sam Gainsford. They were both instrumental in building pressure from each ends. Sam finished with 4-29 off 10 overs. Parramatta rebuilt after that and put on another couple of 35 run partnerships which got Parramatta to a total of 7-214 off 50 overs. The Tahs had a couple of drop catches which really ended up affecting the total. We should have held them 190 max. Manly didn’t start well with the bat losing Jack Ritchie in the first over. Max Webber (39) and Tim Donnan (23) rebuilt a 66 run partnership then we suddenly lost 3 for none with Max, Tim and Aaron back in the sheds. We were 4-66 off 23 overs. It was hard to recover from here as Gainsy (10) went soon after 5-82 and then another collapse in the batting line up saw us lose 5 for 7 runs – Ash, Tom(20), Elliot, Vumbaca and Starr. Our innings was over as we were 92 runs short. Hopefully learning from this game the boys are going to turn the season around by batting long and taking our catches. There is something special about this group and it will go far in the competition. The lads arrived to the pristine Merrylands oval buzzing to get 6 points. The day started off well with Captain Nickoz finally winning the toss and electing to bat. On a flat deck, the Tahs gave away 3 early wickets, leaving us at 3-29. A great partnership between Sam Webber and Jacob O’Sullivan started to flourish. They were effortlessly working singles and putting the bad deliveries to the fence. 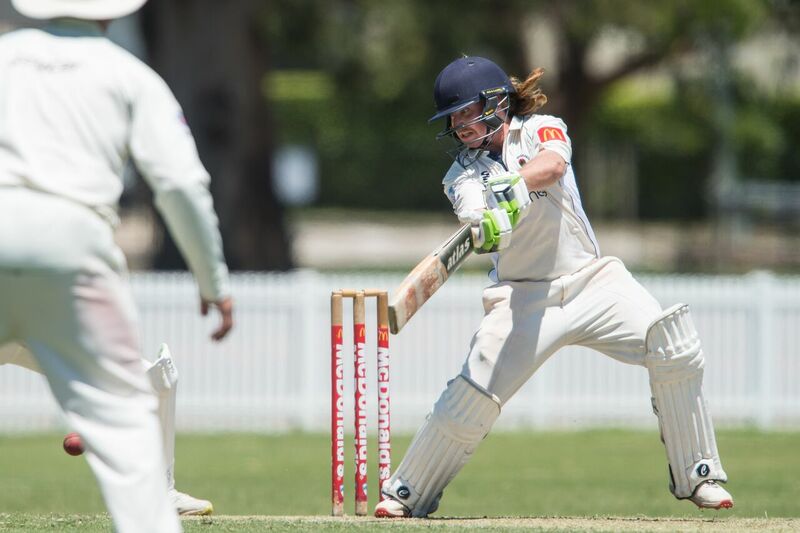 O’Sullivan raised his bat for his half-century but quickly departed afterwards at 4-98. Swebbs and Jesse Moffat continued batting well before being dismissed in the final overs. The Tah’s ended with a score of 188, well and truly below par on the flat deck and quick outfield. The star-studded pace attack could only get a couple of poles with Parramatta chasing our total in the 38th over. Nick and Taylor both bowled well, using cutters and varying pace to get as much out of the flat deck as possible. However, the lads gave a few too many boundary balls and before we knew it they had chased down our score. On another day where we took our chances and have some favourable decisions from the umpires the Tahs could have pushed for the 6 points, but it was not to be. The lads are looking to bounce back next round and show just how good this team is! The Manly boys arrived to a top-soiled Graham’s Reserve eager to keep the momentum flowing with a win against Paramatta. Having lost the toss on an absolute road, we were surprisingly sent into bat. Openers Cohen and Gummer strode to the crease before Adam departed early. This combined the housemates together, Cohen and Wheeler, who created a strong partnership, taking the score over 70 before Wheeler was caught for a well made 37. Hole entered the crease and made a quick cameo before he too departed. Zach Trewartha (32) combined with Cohen to push the score into the 130s before Cohen (39) and Zach departed with the score in the 140s. Late hitting cameos from Crombie (13), Brewster (11) and Bain (24) ensured we reached 8/198 off our 50 overs. With the outfield slow and the pitch getting lower and lower, we were excited about getting out and finishing the job off with the ball. Opening bowlers Wiggers and RBP took the new ball and created havoc from ball one. Consistent line and length from both bowlers allowed the Tahs to build pressure which led to Parramatta losing 2 quick ones to have the score at 2-20. However, some undisciplined bowling allowed Parramatta to create a strong partnership and at 2-100 the Manly boys had their backs against the wall. Skipper Adam and workhorse Jacob ‘Yak’ Graham halted the Parramatta innings, with Adam taking 4 crucial wickets and Yak with one to allow the Tahs to take full control of the game again. Wiggers and RBP entered the crease again and finished off the game ensuring the Manly boys take the 6 points home. Wiggers ending with 2 poles and RBP with 3. The lads rocked up to Parramatta on the weekend. Skipper Dill won the toss and elected to bowl on an interesting looking pitch. Bennett and Hobson opened up the bowling and got the 5th grade boys off to a great start with the lads bowling great areas and coming off with the rewards they deserved. 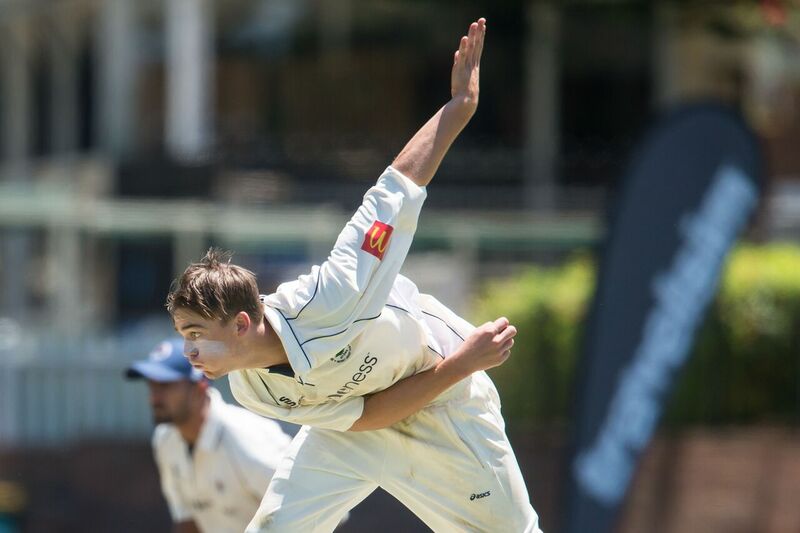 Aiden was the pick of the bowlers, bowling with great pace and accuracy and got a very well deserved 5-fa in which he played a major role in helping the Manly boys bowl Parramatta out for 93. The boys went in to bat after lunch with a great intent to chase down the total. We lost a few wickets during the process but Charles and Sam were able to get us home. All in all it was a great day out for the Manly lads. The Manly boys rocked up to Manly Oval excited about the days play ahead against Eastern Suburbs. Knowing a win was required to keep any chance of playing finals cricket alive, we arrived focused and were eager to hit the ground running. After a good warm up and a sub-par touch footy performance from Duncan Kerr and bias refereeing, the boys were asked to bowl first on a flat deck. Foster and our English first-gamer Beardy, opened the attack and soon had rewards with both bowlers grabbing a wicket before a couple of partnerships developed for Easts. The Manly boys quickly begged them back and with consistent bowling from all bowlers, managed to bowl Easts out for 148 off 48 overs. A very chasable total, which would determine the outcome of our season. All bowlers toiled hard on a flat surface with Foster taking 3, Carden and Starr with 2, and Beardy and Joey taking 1 each. Openers Jack and Ned went about chasing down the total. It wasn’t the start we were after with Jack and Ollie being dismissed early on. Foster (17) and Brewster (23) partnered Ned in the middle and we were looking on track at 4/97 to chase down the total, however as it has been all PGs season, we couldn’t finish the job. The Tahs disappointingly losing 6/20 to be bowled out for 116 in the 37th over. Ned top scoring with 37. A disappointing day and season for the PGs boys however with two games remaining we will be looking to regain ourselves and finish the season off in the way we should’ve played the entire year.